A remodeling project at a popular fast food outlet is ruffling the feathers of a few regular customers as of late. 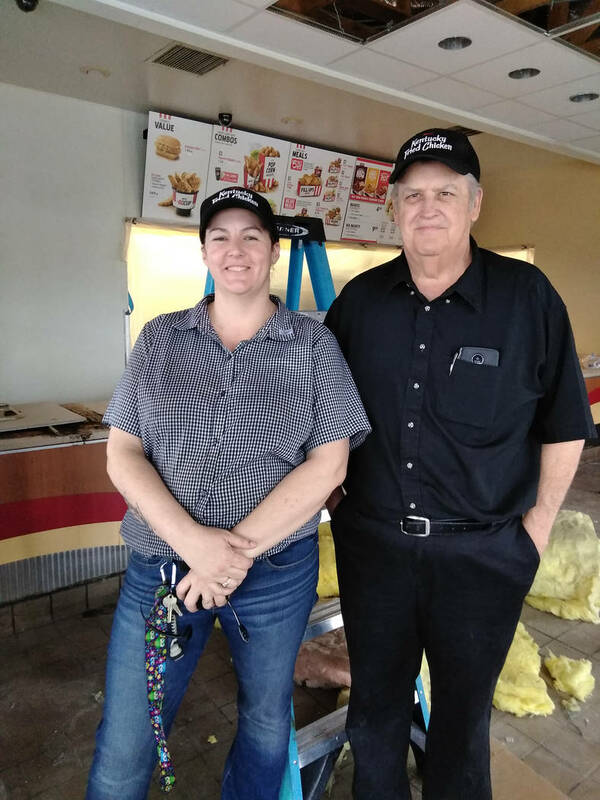 Selwyn Harris/Pahrump Valley Times Pahrump KFC Manager Melissa Smith, left, along with Area Manager Steve Utley, stand amid debris in the lobby area as an image enhancement project is now underway at their 1540 Highway 372 location. The project which began earlier this month, is expected to be completed on April 6. 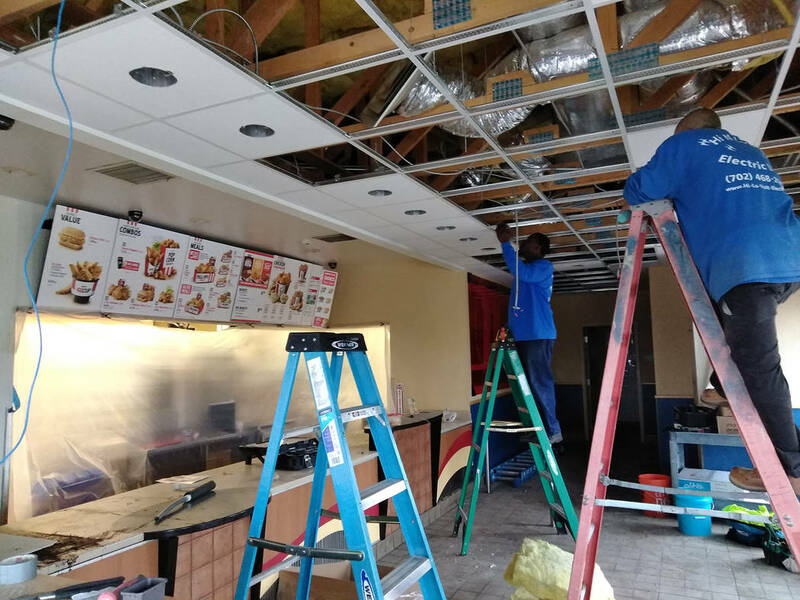 Selwyn Harris/Pahrump Valley Times New walls and ceilings will be part of the decor in KFC's lobby and dining room as an interior upgrade is now taking place at the business. Additionally, energy saving LED lighting and brand new signage is also part of the project. for the businesses' image enhancement project. 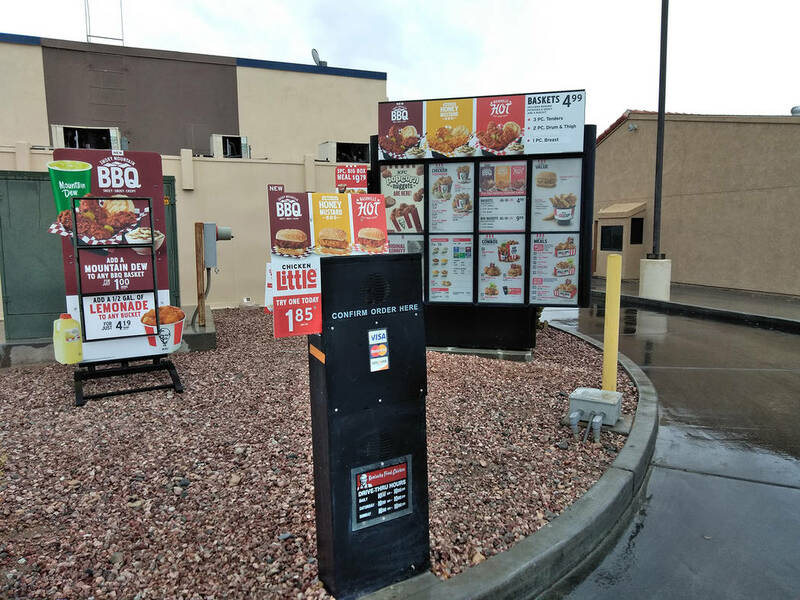 Selwyn Harris/Pahrump Valley Times For the next few weeks, customers at KFC will be forced to use the drive-thru to place their orders, as an image enhancement project is now underway in the lobby and dining room areas of the business. Work is expected to be completed by April 6. Pahrump’s Kentucky Fried Chicken, or KFC, at 1540 Highway 372 is now undergoing what’s known as an “image enhancement” project. Area Manager Steve Utley said that although the new endeavor has temporarily forced the closure of the business’ walk-in lobby for the next few weeks, the drive-thru will remain open during regular business hours for customers. Unfortunately, due to safety purposes, no walk-up orders can be taken in the drive-thru lane. The project, which began on Tuesday, March 13, is expected to be completed by Friday, April 6. KFC Manager Melissa Smith noted that quite a few concerned customers have inquired about whether the business is actually shutting down. Utley, meanwhile said the Pahrump KFC location is one of several stores receiving image enhancement. Earlier this year, some KFC businesses across the pond ran afoul of customers when an actual shortage of chicken made world headlines. As a response to angry customers, the fast-food chain ran a full-page ad in British newspapers issuing an apology for shutting down hundreds of restaurants last month because it ran out of chicken. Utley said Pahrump customers need not get their feathers ruffled about a similar situation occurring locally.